Once you hit submit, you will be redirected to a page which will summarise the information you have provided. You will also receive this information in an automated email response. If you do not receive the automated response within 10 minutes (sometimes they are flagged as spam), please call us to ensure the order has gone through. We will email a visual proof with the details you have supplied and guide you through any remaining steps to finalise your order. Thank you. We are adjusting dynamically to the social media world. Therefore we have offered the new grey design instagram frames from the day the design has been introduced. In fact our designs and templates for photo frames evolve together with constantly changing social media market. Of course our primary focus is YOU as a customer and for that reason we listen to any personal tweaks you may wish to do to the standard design. Give your Instagram Photo Frame a personal touch and we won't charge you for any small adjustments. 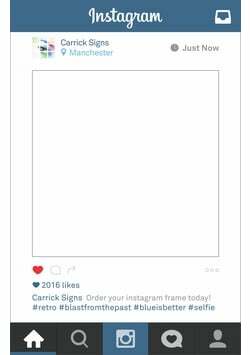 We still offer the old, traditional blue style instagram board if you prefer the older instagram design. Weddings are full of unmissable photo opportunities. Everyone is dressed really nice and each photograph is a priceless souvenir featuring your friends and family, a gathering that happens (hopefully) ones in a lifetime. Wedding Selfie Photo Frames are one of the best and simplest wedding entertainment ideas. They are also one of the cheapest attractions you can imagine, certainly a tiny fraction of a wedding cake cost. 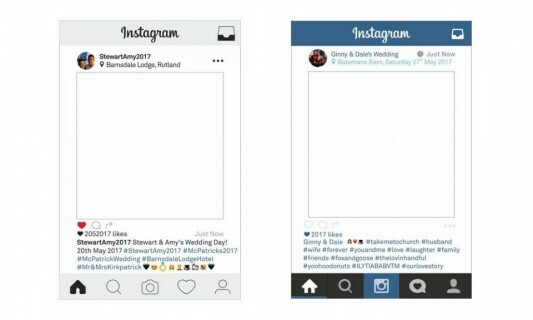 Wedding frames can be based on an Instagram template (if many of your friends are on Instagram). However, since we print everything from scratch and have designers on board we can make your frame as personal and beautiful as you like. It could be a nice wedding selfie frame and not necessarily a social media instagram frame. We can personalise and print photo booth frames of any kind. 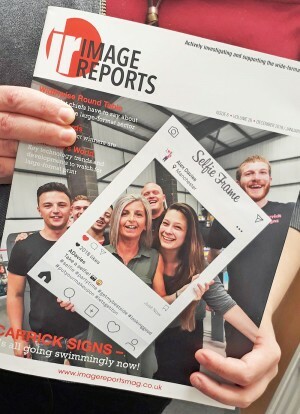 Whether it's Instagram, Facebook or any social media frame or completely bespoke photo booth prop we are here to bring your photo frame idea to life. Most of our selfie frames are shipped within 2-4 working days making us one of the fastest large format print companies on the market. Fast track delivery on instagram frames is essencially a standard practice in our company and we don't normally charge extra for fast design or print service. If we can physically send your order out today or tomorrow we will do that without any unnecessary delays! Even super fast shipping will never compromise our high quality print or design personalisation service. 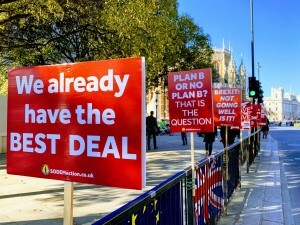 Double sided social media frames are very practical in most cases as obviously only one side can be used for taking photos so the other side could be used for alternative design or even future event. 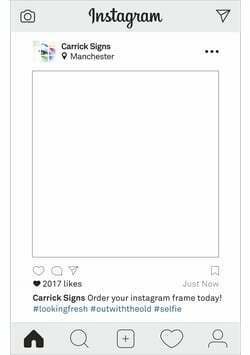 We print double sided instagram frame boards for just 50% extra but please check on our price list, give us a call or email us to get an exact quotation depending on your size/design. Almost any shape possible (oval, rounded corners, heart, custom etc.). Approx sizes, actual size will depend on your required frame shape. OTHER CUSTOM SIZES AVAILABLE, PLEASE ASK. We charge just 50% extra for printing and making a double sided selfie frame. 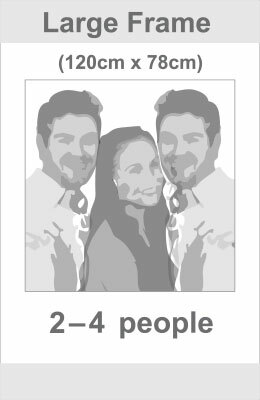 Double sided selfie boards are very practical, allowing to have, in effect two alternatives designs of instagram or bespoke selfie boards. Contact us for exact quotation for bespoke sizes and quantities. We use many major UK couriers: UPS, TNT, Parcelforce, Tuffnells. Please note that even if the delivery service is normally 'next day' we can't guarantee that as after leaving our premises the goods are normally out of our control. You can also collect your items from our company location in Whitefield. Instagram Frame is a Photo Frame prop with design incorporating Instagram social media profile details so it resembles real online social media profile. 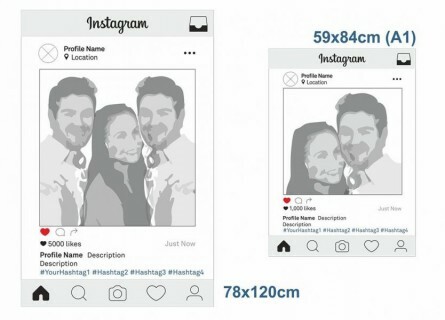 What is Instagram Frame used for? Instagram Frame is used to take Photos or self-portrait photographs (selfies) so you can see people inside the frame board as well as social media details on the frame design. The main purpose of instagram frame photo is that you can share and promote your social media presence for business or leisure purposes. How can Instagram Frame help promote your Business or Social Media Profile? The clue to the phenomenon of instagram frames or generally social selfie frames lies mainly in the sharing channels. By providing entertaining photo opportunity to people you can not only use those photos on your own online media but also hope that people will share their own pictures on their own profiles and this way promoting your brand, hashtags or other message printed on the frame. How many people fit in one of your selfie frames? The bigger selfie frame 120 x 78cm we recommend for 2 to 3 people. 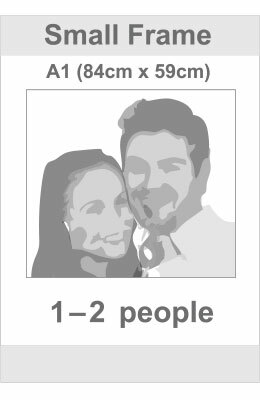 The A1 selfie frame however is great for just 1 or 2 people. We can do custom sizes on our frames as we are a printing company we can help you make your own instagram frame whether its a small or big instagram frame were here to help! Can I order double sided instagram frame / selfie frame? Yes, we print double sided selfie frame boards. Normally it is just 50% extra but please check on our price list or give us a call or email us to get exact quotation depending on size/design or even shape. Double sided selfie frames are very practical in most cases as obviously only one side can be used for taking photos so the other side could be used for alternative design or even future event. Can you use other materials? We recommend foamex as it ticks the most boxes in regards quality and rigidity whilst still staying light enough to use even in the larger size. However if you do require other materials feel free to ask one of the team and we would be more than happy to supply these on one of the other many materials we use to print on everyday. Do you do other frames? Yes, we can make any type of photo booth frame you like, these have been known to include Wedding instagram frames, facebook frames, party prop frames, life size instagram frames, giant instagram frames, company photo frames, children photo frames and many many more. Do you do card or cardboard selfie frames? To assure high quality of print and material and best customer experience we chose not to print Instagram frames or photo booth frames on cardboard or card material. 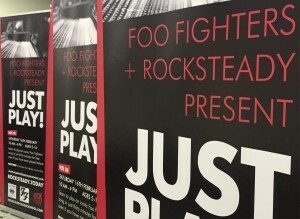 Instead, we print on 5mm foamex (foam pvc). However, if you have a special request for selfie frame print on card o other environment friendly material please give us a call and we should be able to print and supply cardboard frame to you. What is foamex and why do you use it for printing selfie boards? Foamex is a popular name for rigid, hard Foam PVC board. It is also called Forex. Foamex does not look or feel like foam material, it looks and feels rather like hard matt plastic and therefore is much more withstanding than any other light foam-like boards or corrugated plastic. We recommend foamex as standard for selfie frames to ensure highest quality and long life of the product especially if used on repeated occassions and by many people during one party event. How thick are your Selfie frames? 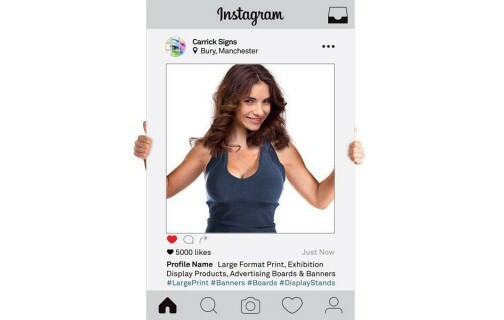 We can supply our social media frames in either 5mm of 10mm thickness. The most popular thickness is 5mm and is suitable in most circumstances however we do offer the 10mm thickness at an extra cost for anyone who is after something a little more hardwearing. When will I receive my instagram boards or selfie frames? Our standard printing production lead times for majority of orders is 2-5 working days. However, very often, depending on our current production load, we are able to despatch instagram frames much faster. Once the production process is accomplished we can offer next day delivery service to virtually all UK mainland locations.